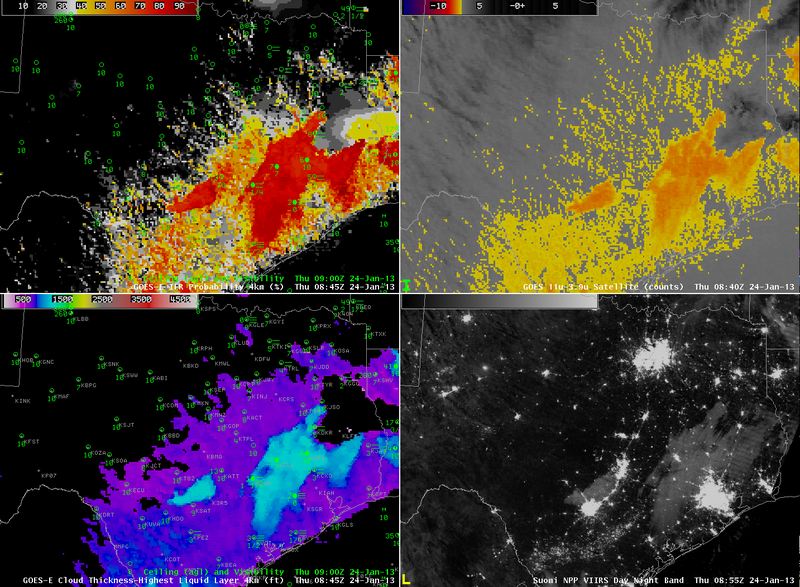 The two images looping, above, show two different schemes used to detect fog and low stratus. The one that highlights mostly land over New England is the GOES-R Fog/Low Stratus product, and it shows mostly uniform probabilities over southern New England, with a patch of higher probabilities in central Massachusetts and over southern Maine. In contrast, the Brightness Temperature Difference Product — the traditional method of detecting fog — highlights a large area over the ocean (as well as a region in central Massachusetts that stretches southeastward to Block Island). Note that the regions of IFR conditions are over land. The offshore islands, and Cape Cod, do not show IFR conditions even though the heritage fog detection product has a strong signal offshore. GOES-R IFR Probabilities are highest in central Massachusetts. This is where both predictors — the Rapid Refresh Data and the satellite data — strongly indicate the presence of fog and low stratus. The interpretation that should be given where roughly homogenous regions of IFR probability surround a region of higher, more variable IFR probability, as is happening in central Massachusetts, is that higher clouds (or multiple cloud layers) have parted over the region of highest IFR probabilities, allowing the satellite signal to be a factor. This would also be a region where GOES-R Cloud Thickness could be computed. In regions offshore, IFR probabilities are low despite the strong satellite signal becaure the Rapid Refresh data is not modeling (properly) atmospheric conditions conducive to IFR conditions. This entry was posted in Multiple Cloud Layers, New England on January 30, 2013 by Scott Lindstrom. It’s very common in late Winter and early Spring to have a cirrus shield over a region of dense advection fog. The water vapor imagery, above, shows the cirrus associated with a developing warm conveyor belt over the central part of the USA. Note how the cirrus signal also shows up in the brightness temperature difference field, and the emissivity properties of ice clouds differ strongly from those of water-based clouds (that in the enhancement in the upper right are orange versus black for ice clouds). The presence of cirrus also precludes computation of GOES-R cloud thickness, as shown in the lower left imagery. 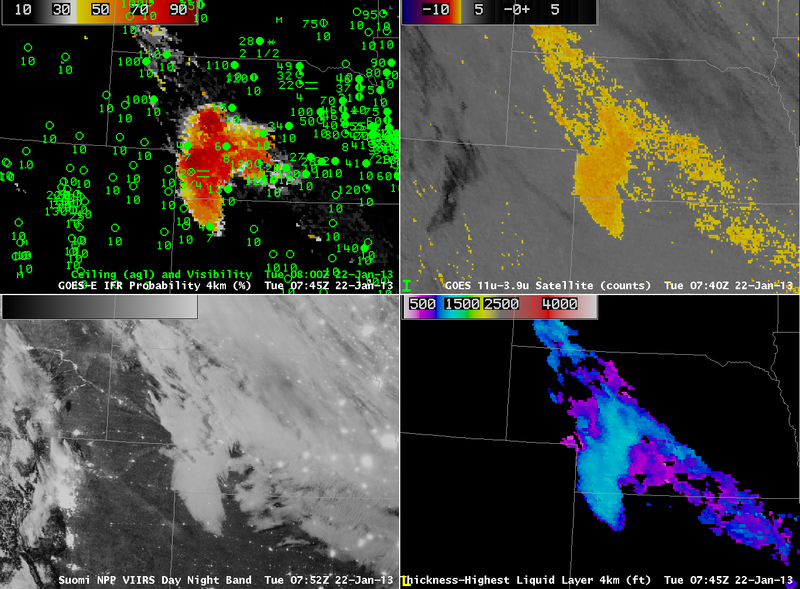 GOES-R IFR probabilities allow for the identification of regions of low clouds/fog even underneath the high clouds. Note over Michigan the relatively high probabilities. The probabilities are generated using only model-based predictors (because the satellite algorithm sees only the high clouds so satellite predictors are very small or missing). The 1000 and 1300 UTC imagery, below, shows widespread IFR conditions underneath cirrus over Michigan and surrounding states. IFR conditions are generally present in regions where the IFR probabilities are high. 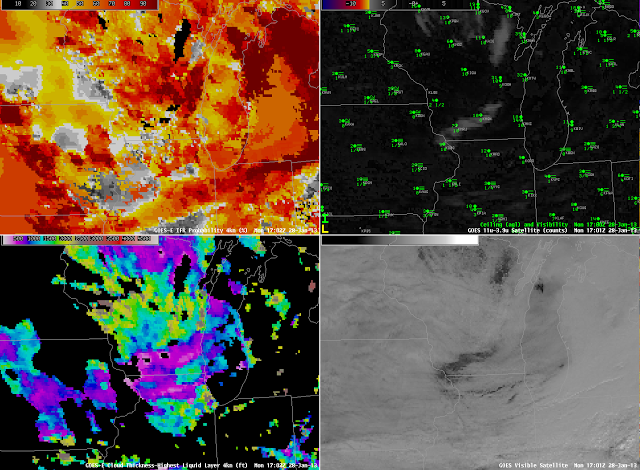 Ceilings/visibilities do not meet IFR criteria over Western Illinois where IFR Probabilities are much lower. This entry was posted in Cloud Thickness, Midwest, Multiple Cloud Layers, Northern Plains on January 29, 2013 by Scott Lindstrom. 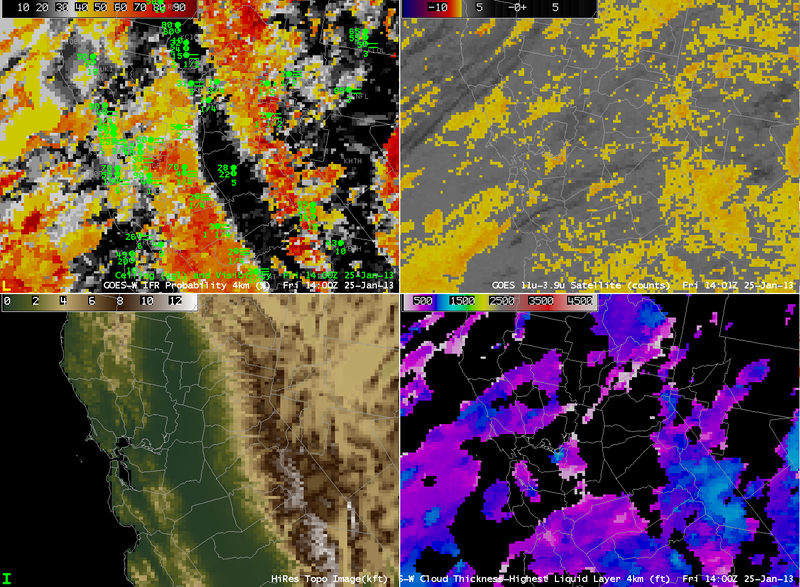 GOES-R IFR Probabilities from GOES-East, hourly from 00:15 through 13:15 on 28 January 2013, with surface visibilities and ceilings. Warm and moist air streaming north from the southern Plains has encountered the cold (and in some places) snow-covered ground. This is a time-honored recipe for advection fog, and the GOES-R IFR Probabilities fields, above, neatly capture the horizontal extent of the visibility restrictions overnight. The highest IFR Probabilities occur in regions where both Satellite Predictors and Model-based predictors are high. Note, for example, the somewhat lower probabilities that develop over Nebraska at the end of the animation. This is a region where higher clouds are moving in. Note how the Cloud Thickness product is not computed where the higher clouds are moving in. The product is computed only where single layer clouds are present in non-twilight conditions. Twilight conditions are present in the eastern half of the final image, at 1315 UTC. When radiation fog is present (rather than advection fog in this case), the last cloud thickness before twilight conditions can be used to estimate dissipation time using this chart. Holes in the advection fog developed around 1700 UTC. This entry was posted in Cloud Thickness, Mid-Atlantic, Multiple Cloud Layers, Northern Plains on January 28, 2013 by Scott Lindstrom. 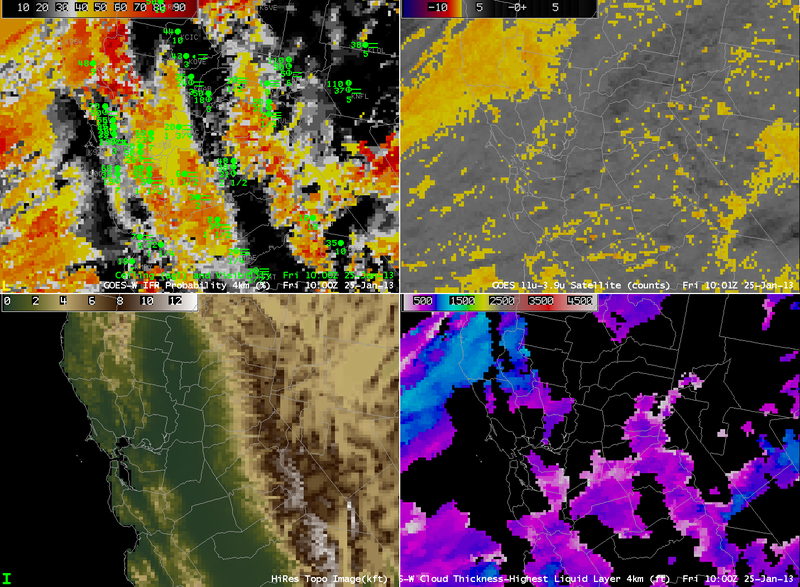 GOES-R IFR Probabilities suggest the presence of IFR conditions both to the west and to the east of California’s San Joaquin Valley, providing a much more coherent signal of IFR conditions than can be discerned from the traditional Brightness Temperature Difference Product. That traditional product is hamstrung by the multiple cloud layers present over the West Coast as an extratropical cyclone approaches from the Pacific Ocean. The signal present at 1000 UTC (and earlier) continues through most of the morning. The synthesis of Satellite Predictors and Model Predictors (Rapid Refresh Model) in the Naive Bayesian Model produces a product that gives better information in this case on exactly where IFR conditions are most likely. This entry was posted in California, Cloud Thickness, Terrain on January 25, 2013 by Scott Lindstrom. Clear skies and light winds again allowed for the development of radiation fog over southeast Texas. How did the development, and the detection of fog, differ for this event from the event 1 night previous (as discussed here). 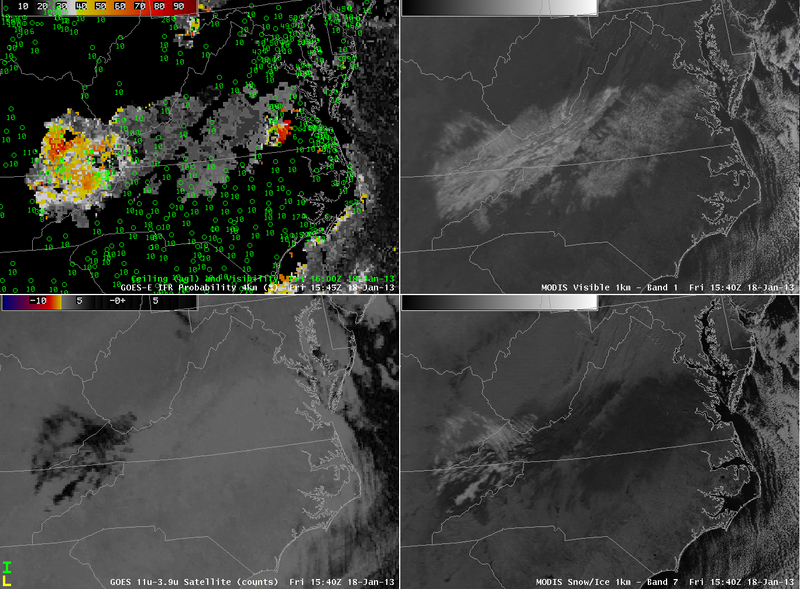 The 0615 UTC imagery, above, shows a separation between where the Brightness Temperature Difference (the heritage fog detection product) and where the GOES-R IFR probabilities are suggesting fog is present. The Heritage Fog Product is focused on the Rio Grande Valley whereas the GOES-R IFR Probability is focused (correctly, as it turns out) on southeast Texas. Note also that the Brightness Temperature Difference product has a signal representative of higher clouds (the dark region) over northeast Texas. 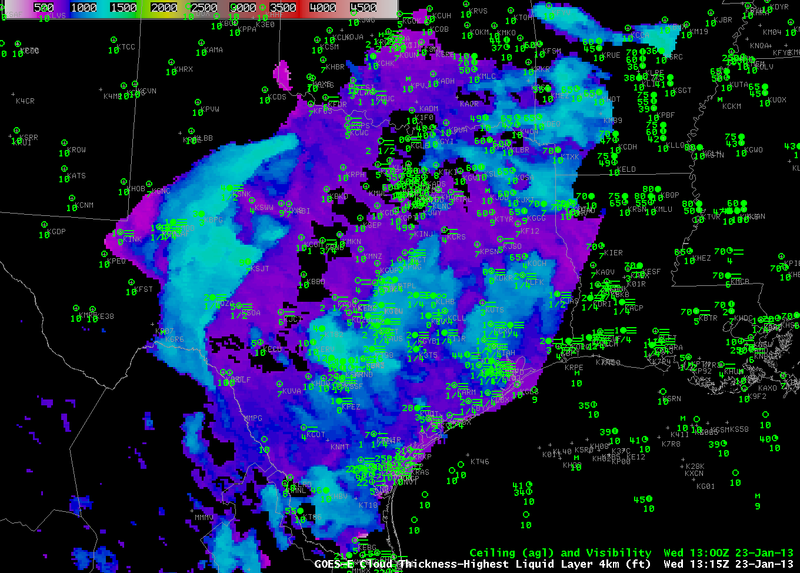 At 0715 UTC, IFR probabilities are increasing over southeast Texas between Houston and San Antonio. Suomi/NPP Day/Night band imagery at that time shows evidence of clouds in the region of highest IFR probabilities. 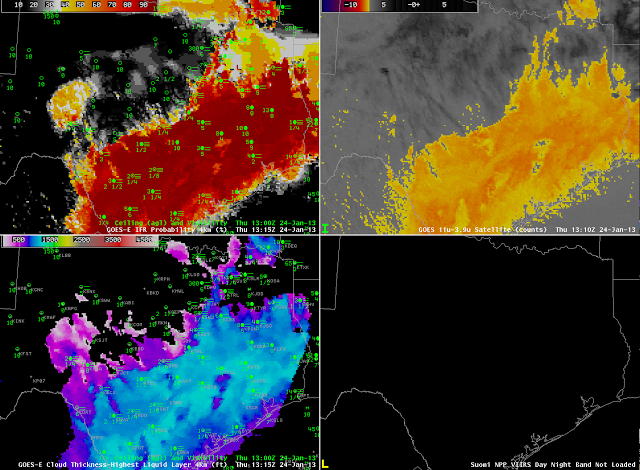 The traditional brightness temperature difference product continues to highlight a region near the Rio Grande Valley. At 0845 UTC, IFR probabilities continue to increase over southeast Texas in the region surrounding Houston and a region near San Antonio. The Day/Night band detects the cloudiness present in those regions. High clouds persist over northeast Texas. Shortly before sunrise, fog is widespread over southeast Texas. 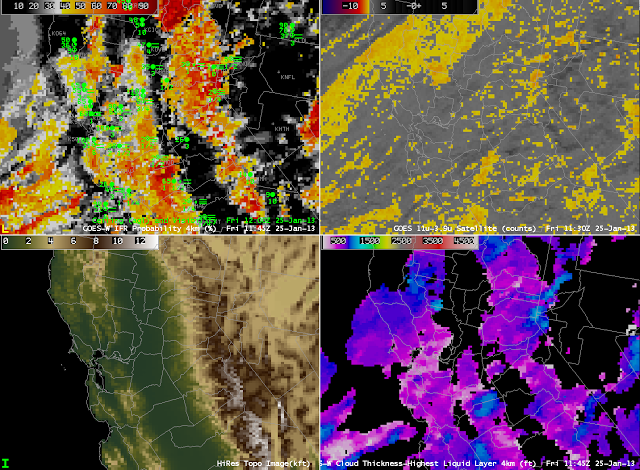 IFR probabilities are highest where both model and satellite predictors can be used. Over northeast Texas, where cirrus clouds are present and where the brightness temperature difference product can therefore not provide guidance, the Rapid Refresh data are suggesting that fog is present (as observed), but IFR probabilities are lower because the satellite predictor is not used. This entry was posted in Cloud Thickness, Day/Night Band, Suomi/NPP, Texas on January 24, 2013 by Scott Lindstrom. 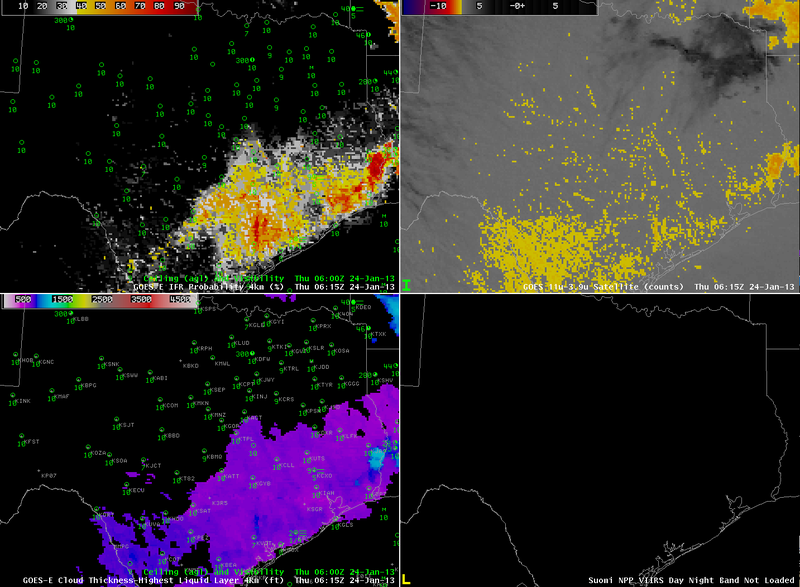 Light winds and clear skies over Texas promoted the development of Radiation Fog early in the morning on 23 January 2013. The animation above shows hourly snapshots of GOES-R IFR Probabilities and observations of Ceilings/Visibilities. IFR conditions develop first near the coast and then spread inland. IFR probabilities neatly match the regions of observed IFR conditions. 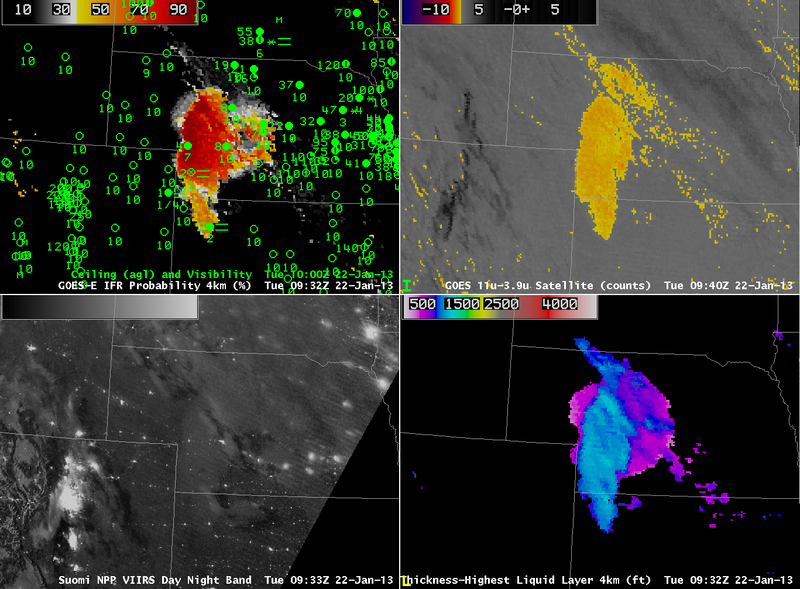 GOES-R products also include Cloud Thickness, below, which can be used to estimate the time of Fog Dispersal. Maximum values of Cloud Thickness in central Texas are 1200-1300 feet, and according to this chart, that suggests a dissipation time of more than 4 hours, or sometime after 1715 UTC. The visible image from 1745 UTC on 23 January, below, shows a small patch of stratiform clouds remaining where the thickest radiation fog had been. The animation below includes the traditional fog product, the brightness temperature difference between 10.7 µm and 3.9 µm. The GOES-R product refines the satellite estimate of fog/low stratus by using data from the Rapid Refresh Model. This entry was posted in Cloud Thickness, Texas on January 23, 2013 by Scott Lindstrom. High Pressure with origins in the Arctic has pushed cold air into the central United States. The western edge of the cold dome shows as a stationary front that stretches from central Kansas northwestward into Montana and beyond. 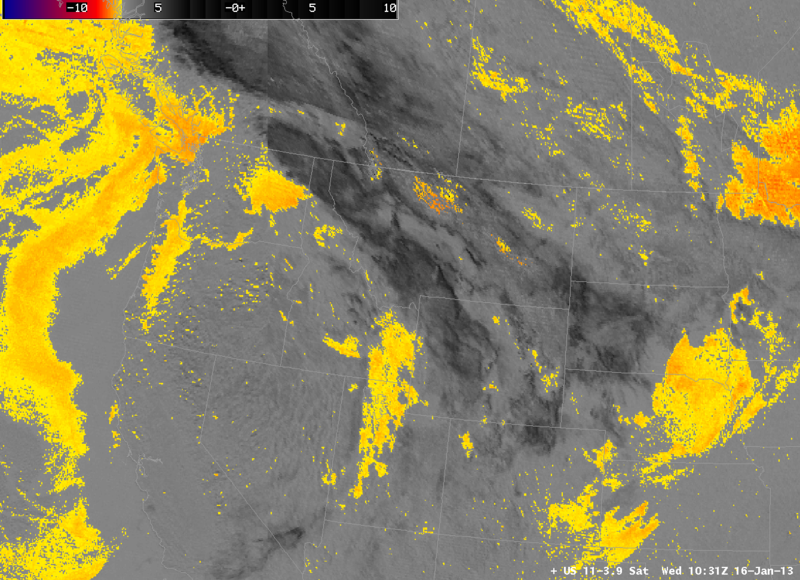 During the early morning hours of 22 January, a small region of IFR conditions developed over western Nebraska. How did the GOES-R Fog products do in describing this region? 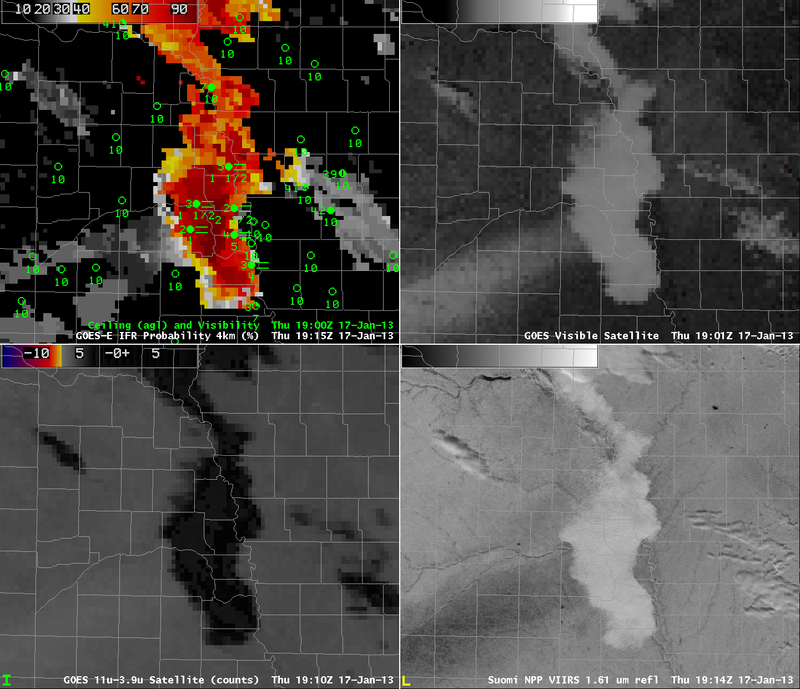 The animation above shows increasing IFR probabilities over southwest and west-central Nebraska over the course of the night in a region where IFR conditions are developing. Note how the IFR probabilities are not enhanced in regions where the traditional brightness temperature difference product does have a signal — over eastern Nebraska and northeastern Kansas. In these regions, the Rapid Refresh Model fields likely include no saturation in the lowest model layers. Suomi/NPP Night-time Visible imagery, below, at 0752 UTC and at 0933 UTC also show the extent of the fog and low stratus. However, it’s impossible to tell from the satellite where the visibility obstructions are most likely — that’s why the model data are important in this fused product. Note the distinct change in illumination between 0752 UTC and 0930 UTC. The Waxing Gibbous moon set around 0900 UTC. This entry was posted in Cloud Thickness, Day/Night Band, Plains, Suomi/NPP on January 22, 2013 by Scott Lindstrom. The image above shows how IFR probabilities can maximize over higher terrain where mountains rise up into a somewhat uniform cloud deck. IFR probabilties are highest over the Laurel Highlands of Pennsylvania southward along the spine of the Appalachian Mountains in West Virginia (and also in the highlands of north-central Pennsylvania). IFR Conditions are reported at K2G4 in Maryland, which is 890 meters above sea level, and near-IFR conditions are present at Johnstown, PA (KJST) and Elkins, WV (KEKN), two stations above 600 meters above Mean Sea Level. In contrast, KCBE and KW99, Cumberland Maryland and Petersburg, WV, are both lower than 300 m above sea level, and IFR condition are not present there. GOES-R IFR probabilities maximized near the Missouri River Valley in eastern Nebraska around mid-day on 17 January 2013. IFR conditions were reported. The largest visibility restrictions appear to occur over a band of snow that extended southwest to northeast, roughly parallel to the N. Platte River, and IFR probabilities are highest in that region. The snow band shows up well in the visible imagery, and as a black swath in the 1.61 reflectivity (snow absorbs radiation at 1.61µm). This entry was posted in Mid-Atlantic, Plains, Suomi/NPP on January 17, 2013 by Scott Lindstrom. The plot above shows the default enhancement the brightness temperature difference product traditionally used to highlight regions of low clouds and fog. The greyscale nature of the product can make interpretation difficult. However, if a suitable enhancement is applied (below), such that fog and low clouds are enhanced, interpretation is easier. 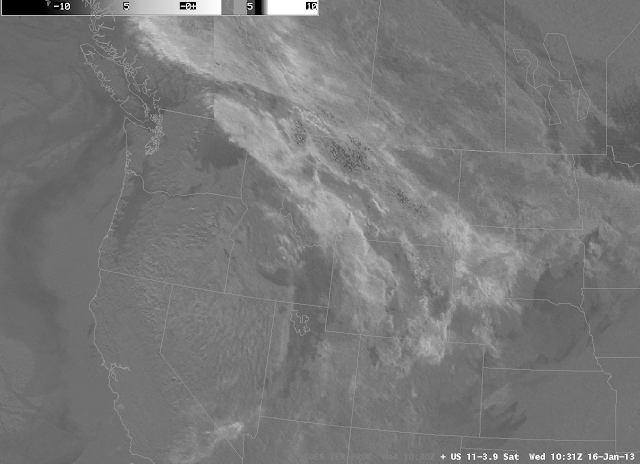 This image suggests the presence of fog or low stratus (or both) off the west coast of the US, in and around Salt Lake City, near Spokane, and in the Willamette Valley and Columbia River Valley. It is difficult to tell if the regions are associated with restrictions in visibility because an elevated stratus deck and a fog bank look very similar in the brightness temperature difference field. Therefore, the GOES-R Fog/Low Stratus IFR Probability field was developed to highlight regions where IFR conditions are most likely. That product is shown below. 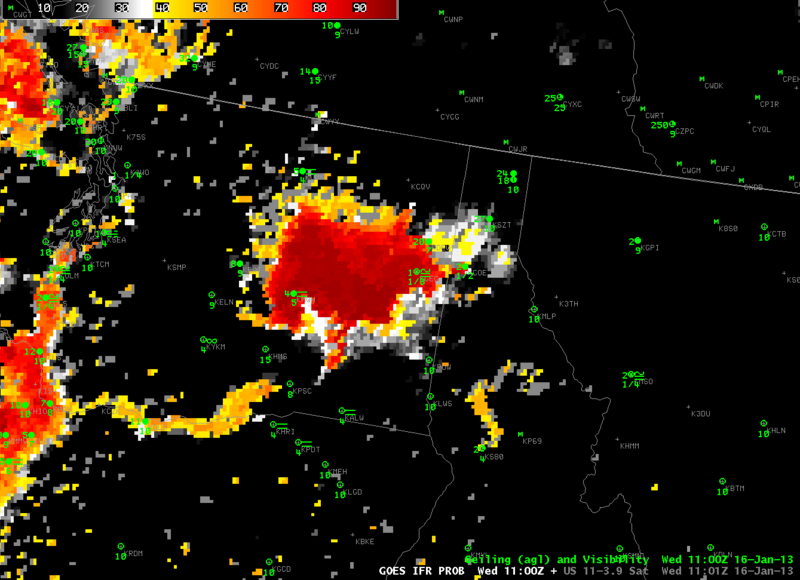 Compare the IFR probability field to the Brightness Temperature Difference field above it. Several things are apparent. Highest probabilities for visibility restrictions are centered near Spokane, WA. There is a region of higher IFR probabilities in North Dakota that is missing entirely in the Brightness Temperature Difference product. 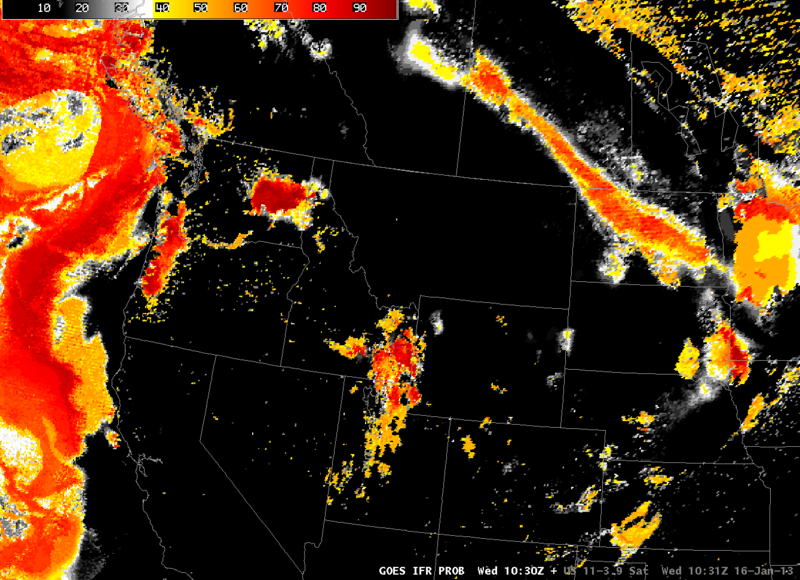 IFR probabilities over Utah vary more than the Brightness Temperature Difference signal. The differences all arise from the model data that are used to better highlight where low-level saturation is occurring. IFR Probabilities and observations of Ceilings/visibilities from 1100 UTC on 16 January. 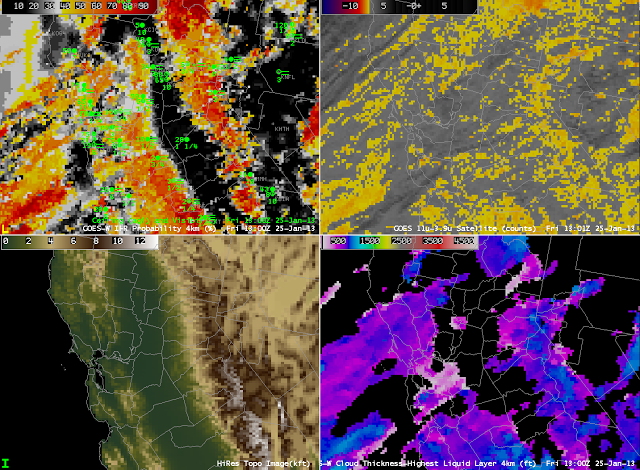 This zoomed-in imagery shows that, indeed, visibility restrictions (IFR conditions) are occurring in eastern Washington. The strength of the fused product is that is provide a coherent signal over a larger area, so you can better define the region of IFR conditions than is possible with surface observations alone. The region of higher IFR probabilities over North Dakota is also associated with IFR and near-IFR conditions in a northwest-southeast oriented strip including Harvey and Jamestown, ND (not shown). This entry was posted in Pacific Northwest, Terrain on January 16, 2013 by Scott Lindstrom.